John and one of his klarina, Summer 2007. Yiannis Pappayiorgas in Foustanella of Kandyla, Tripoleos, Arkadia. My name is John Pappas; my original, Greek name is Yiannis (Ioannis) Pappayiorgas. 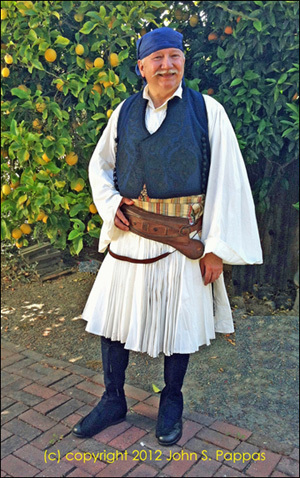 This site contains information on Greek folk music, Greek dance, traditional Greek costume, and related Greek folklore. I will be adding and changing my Greek music and Greek dance information on a fairly regular basis, so feel free to drop in regularly to see what is new! 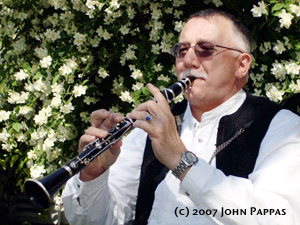 Purchase a handmade Greek shepherd's flute (floyera or tzamara), via the "For Sale" page! I have produced recordings of traditional folk music for many of the regional Greek folk dances, which you can order through this site. Right now we offer four CD volumes of music. You may also purchase dance descriptions for many of the Greek dances that I have learned and researched over the years. On occasion, I may also sell items from my folk instrument collection here on the site. If you're planning a church festival, wedding, baptism, or party to be held in Northern California, our traditional Greek folk orchestra, T'Adelphia, is available to provide dance and listening music for your enjoyment. Our five-piece ensemble performs music from all regions of Greece, featuring the klarino (Greek clarinet), bouzouki, and violin. The links at left will direct you to the appropriate pages. Thank you for visiting! Header Photo: Bouzouki by Kyriakos Lazaridis, once owned by Iordanis Tsomidis. PLEASE NOTE: All content on this site is my intellectual property, unless otherwise specified. The words, photos, drawings, recordings, and more are NOT in the public domain, nor are they available to reproduce, distribute, or use in any way without my express permission. Be advised that the internet is NOT free pickings. Also be aware that even items that do not bear a copyright notice are still subject to copyright protection according to the United States Code.